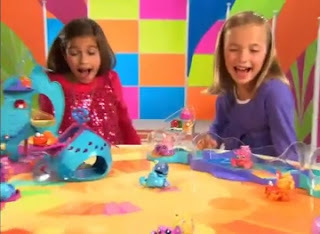 Shah Shah or Xia Xia Hermit crabs are the newest and hottest toys of this year 2011. They definitely are going on the Christmas list of every little boy and girl. These toys are the latest release by Cepia LLC very huge toy company, I said very huge, because they made Zhu Zhu Pets and DaGeDar and many other cool toys for kids. They definitely know what kids like and how to surprise them. Just look at Sha Sha crabs they come with removable shells and little collectible Xia Xia friends, that can ride on top of hermit crab toys or can be stored inside their shells. These crabs acts very close to Zhu Zhu Pets, Xia Xia or Sha Sha or Shah Shah pets have built-in sensors. When they meet a barrier they go back and turn around to switch the direction. Sensors are built-in in their claws, so if you touch them crabs start to react. Therefore Cepia's hermit crabs are nore only movable, cool, colorful and funny toys, they are also interactive little pets, that can interact with kids, habitats and each other. For now there are only four characters: Turks, Tobago, Trinidad and Bimini, but you can increase your crab family by changing their shells and creating new personages. Also I'm looking forward to see more Xia Xia (Sha Sha) crabs toys, shells and habitats released. Stay in contact for more information and latest news, and please support us on Facebook and join us on Twitter.